We think of your car as an investment. To protect your investment, we feel factory scheduled maintenance is a must. Jack's Auto Service is an expert in auto repair and service. If you are are looking for an auto repair facility in Grand Rapids, you have come to the right place. 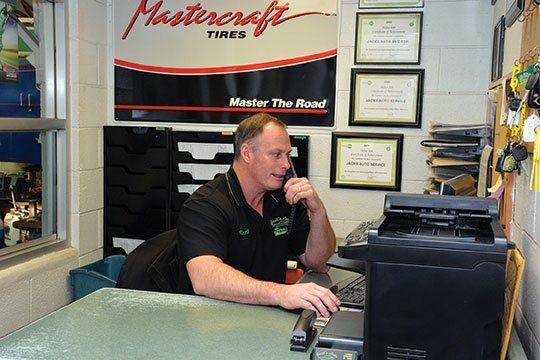 You can count on our team to quickly, efficiently, and effectively service your vehicle. We use only the highest-quality tools and equipment to service and repair your vehicle. Along with having factory-recommended, state-of-the-art equipment, our team is experienced with factory scheduled maintenance for all major automobiles brands. On average, each one of our technicians has worked at our auto repair facility for 10+ years. No matter the car repair issue, from big or small, we can solve the problem. Changing the oil and oil filter. Careful inspection of fluids, filters, belts, hoses, brakes and emissions. The replacement of various filters, fluids, and spark plugs. Timing belt replacement at the manufacturer’s recommended replacement interval. If your personal automobile or fleet is in need of factory scheduled maintenance or repair, we invite you to Jack’s Auto Service in Grand Rapids. You can trust our friendly and experienced staff to get your car, truck, minivan or SUV driving its best!